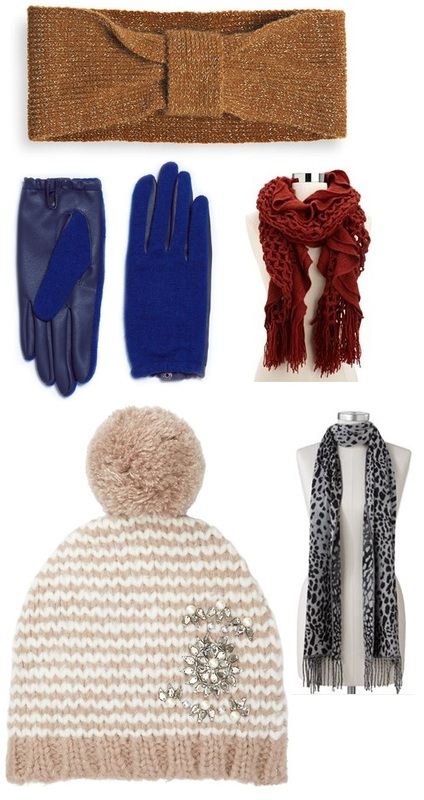 2013 Black Friday Style: Watch Out For Cold Weather Accessories! ‘Tis the season for cold weather accessories, & they always make for a great gift for the holidays. However, if you’re looking to mix up your outerwear look, but love your classic coat, changing up your hat, scarf, & gloves will do the trick! I’m a big fan of scarves, wearing them with my coats & coordinating them with my tunic sweaters & other essentials. Some suggestions that break that break the conventions of neutral cold weather accessories include the following: metallic headband ($12.00) in camel @Avenue, short faux leather gloves ($25.90) in navy @Zara, ruffled open knit scarf ($12.99) in rust @Charlotte Russe, pearlized gem embellished hat ($34.50– use code ENJOY for 40% off) in pale berry pink @LOFT, & Croft & Barrow’s ombre animal fringed scarf ($9.99) @Kohl’s. I’m such a big fan of patterns when it comes to scarves, especially polka dots or houndstooth, which is why I also wanted to feature these other accessories for more shopping fun: Aeropostale, Wet Seal, Ann Taylor, QVC, Joe Fresh, & Urban Outfitters. Happy Styling! This entry was posted in #BlackFriday Sale Update, Accessories Access, Basics for a Bargain, Holiday Gift Styles, Quickie Darling Deal & Steal, Style Darling Daily and tagged Accessories Access, Aeropostale, Ann Taylor, Avenue, Basics for a Bargain, Black Friday, Charlotte Russe, cold weather accessories, ear muffs, gloves, hat, headband, holiday gift style, Joe Fresh, Kohls, Quickie Darling Deal & Steal, QVC, scarves, Urban Outfitters, Wet Seal, Zara. Bookmark the permalink. ← Color Me Style: Breaking The Brown & Black Mixing Myth (Dedicated to Christine)!